I spoke to Ben Parr recently about B2B social media and it got me thinking!!! This morning I woke up to ChrisBrogan's blog about conversation and innovation (not to mention the twinkies picture I saw before breakfast). I am hungrily looking to find ways on how companies engage with their customers using social media. If you are one, please read on and do share your comments. I have used social media in several different ways in the past 3 years. Many are for marketing, from events and sharing new products and features. That is useful but not a conversation! While at Intuit I've done alpha testing of messages using Twitter to test what message worked, at what hour to what segment of audience. Audience reacted and we learned. Not a conversation still! While at DEMO we built community on Facebook with a campaign called "Entrepreneur asks, VCs answer". Users posted questions and VCs answered on the Fan Page. It built community and followers but not a continued conversation. Two weeks back we completed PayPalX Innovate conf and are still wowed by the engagement from our users and the echo of the excitement from our echo system. I loved the conversations, the passion and the real time speed of the echo by our partners, global customers and friends. We had a dedicated team that had the joy of monitoring tweets and responding to users, listening, monitoring beyond our social media presence to scout all conversations and become part of them! We had a separate team that captured the excitement of the 2000 audience and brought videos, live ustream, Tweets, facebook, photos, blogs and tweeted everything out to Millions out there! Now as we take a step back after Innovate I am looking to find how we can continue the monitoring daily to build that listening and social media conversation into our DNAs? How can we go past social media being a job to making it a way of life to have daily conversation with our customers? Can we create processes to listen and metrics to track to see what works to course correct? 1. Bank of America is my favorite example as they always respond and excel in their service using Twitter to go out of their way when I am looking for their ATM or reporting bugs on their mobile app or asking for their service. 2. BestBuy is known for it monitors in their CMO office monitoring all tweets. 3. Kodak is my favorite as they have transformed their business by listening to tweets and letting us name their products, offer deals and for quick support. Do you know of companies/brands beyond CS that uses social media? I am hungrily looking for models here. I'll update here or write another blog summarizing my finding. Which Product Managers use Social Media to listen to customer feedback to build products? Which companies use social media with their suppliers? Who all connect with their partners to extend their relationship across connected communities? Innovate 2010 rocked thanks to all of you who helped make it happen, showed up and immersed us in Innovation. What an awesome two days! Can't believe its over!!! Day2 -Oct 27 - Developers hacked and launched 15 apps overnights, 22 DevChallenge Global Winners showed cool innovations, the winner walked away with a cooler mobile (yeah its real) and the winner was IConcessionstand who won $100K. I don't remember any other conference that had so much developers on stage and part of the show all day long. Watch the Montage of Day2 and decide for yourself. I am humbled by all the teamwork I experienced behind the scenes with fellow PayPalians and the innovation and ideas that sparkled the air all two days. We had fun too, with our parties (too many) . Catch a glimpse of it with the "Live from Innovate" we ustreamed on Day1 with Edwin Aoki, Marsha Collier and THE BenParr with many surprise guests. Michael Brito is here as our guest speaker at Ebay Social Media Council. Here is my summary of interesting learning from the talk about "Social media for business". How do you make your customer that you listen to them? Be Authentic - we are authentic with our families, with our kids teachers, with neigbors. We need to bring that authenticity to the online world. How to make a brand believable? Stay engaged with your customer, that is key to make your brand believable. Ebay is No.3 in Altimeter's Top 10 brands measuring breadth and depth within the social web. If you love your customers, they will love you and tell others. Focus on your advocates more than influencers, they love your brand and tell others. Starbucks splashstick was a crowdsourced customer developers product. GM canceled a car they were designing based on user's feedback. Intel did Ajay Bhatt (founder of USB), was surprised to see users wanted a tshirt seen in the background, moved fast ran a global contest and gave away those tshirts and built Intel Advocates. Smart! Nice success story of how they built brand advocacy by listening to users. I enjoyed presenting Social Commerce Trends to Social DevCamp Chicago last week to an awesome roomful of audience. here is the presentation as I promised to share! Let me know any other trends, companies shaping social commerce. View more presentations from PayPalX Developer Network. First 25 hour summary of IOSDevCamp - awesome community innovation!!! I am very thrilled to bring a quick summary of the awesome energy and excitement of Iphone and Ipad developers from IOSDevCamp, a project my team has been involved to foster community driven innovation. Iosdevcamp is the 5th in a row of IphoneDevcamps organized by a non-profit group of four community leaders - Raven Zachery, Dom Sagella, Christopher and Whurley. It is hosted at PayPal campus (where I proudly work) this weekend Aug 20-22. 300 developers are charged with amazing ideas, forming teams and working hard to build 40+ awesome applications with 55 hours to launch tomorrow night. Here is a montage of the kickoff from friday night kickoff! Today I hosted a BlogTalkRadio show with Raven Zachery of IOSDevCamp, Naveed Anwar and Edwin Aoki of PayPal and met a flow of developers who stopped by and shared awesome ideas they were working on! Daniel Bru who is the most inspiring teenager I've met ustreamed the show live too! Come join us tomorrow (Sunday Aug 22nd) 2 to 4pm as the IOSDevCamp opens the door for friends and family to join us for free to watch and support the launch of the awesome applications to show a sneak peak into awesome future apps and startups in the mobile world!!! If you are far away, you can watch the live stream on the iosdevcamp.org site or watch the twitter stream here. Last night was my 33rd Bay Area Facebook meetup event since July 2007 and I am amazed at the transition of F8 platform and was thinking about the facebook team people who have shaped it and changed it and my amazing volunteer team who run this group for the last 3 yrs. Hiten Shah of Buzz metrics talked about metrics and people came from everywhere to hear him and plan how to measure and tweak their apps for growth. Steve Meretzky and Matthew Davie of Playdom shared their experience on creating viral play and monetization for games. As I sat and watched this intense group of 120 geeks, I realized how Facebook has come from starting with unlimited notifications, to restricting notifications (quoting Zombies app) to recently dropping notifications. FBML to FQL to Facebook Connect to now HTML for fb apps. Ben Ling lead the platform to scale it first, then Dave Morin scaled Facebook Connect and Josh Elman went on connect it to every ecosystem - IBM, Adobe and everywhere on the Web. At the facebook meetup, we started with Lawrence Sinclair, and then came Shuchi Rana, and Abbas Zaidi. Then Perrine Crampton brought her personality to the group and made sure we organized the meetup with google docs and John Lin became the silent force to ustream regularly every month. Now we have Robert Schwentker who brought his unique touch with indepth content and has made last night a huge success. I am thankful for my team, their dedication, creativity and love of geek developer energy which bonds us all. Thanks for all your hard work! I attended Social Media Strategies conference in Santa Clara and started blogging live select sessions I get to attend and the nuggets of wisdom I find worth sharing! 1. Be real people, passionate with reciprocity helps companies on socialmedia. 50% of community members are active lurkers. Companies treat their facebook fan page as coupon centers. Success comes when the people engaging on social media are human. Someone in audience put it well "It is the difference between being and doing". So the lesson is to be real and engage with your customers. Social Media can get your employees to help in areas that was not in their original job responsibility, this is when your have a business process becoming a social process. I can relate to this as I focus on events and social media for PayPal from their Developer Network whose charter is to foster community driven innovation. I get help from multiple teams inside PayPal who are excited to participate in events to meet developers wherever they are and get feedback and help them disrupt payments industry with their innovation. I see a fundamental shift in our internal process as I hear from across our global offices to engage with us with local events and for social media outreach. This is because they engage with customers in some form and are ready to speed that engagement via social media. Two departments that the speaker hasn't seen adopt social are financial dept to social because they are focused on corporate entity, not customers directly. focusing on reviews and community to influence positive referral of your product. Audience were hungry to learn about real experience in making social commerce work for them as entreprenuers, startups and businesses. Mobile Commerce is overlapping with social commerce and there is so much room for innovation. Privacy is important, people will want to each share certain type of information. I met a variety of interesting people and some products. 1. Position2 is a new Brand monitoring tool, looks new fresh UI. I hope to check it out and write further. 2. Met many of the local valley influencers - Shirley Lin from APWT Women in tech group, Mary Vincent of Green Strategy/Greenappstore, several followups from Santa Clara Alum social media panel at PayPal, several cool social media strategy types each with different flavor of experience and expertise. 4. Richard Brewer Hayes of Ebay, awesome speaker and blogger. 5. Ofcourse I met couple interesting people who wanted to switch to PayPal, gave feedback about PayPal APIs and some who had attended Innovate09. Awesome work by Daya and Rashmi of WebGuild with another successful show. Nice detail on a sit down lunch, excellent speaker, good workshops, crowd, mixer and care for detail on content. I look forward to Day2. I am participating in a social media metrics panel at 2pm. Hope to see you there! A Cone of Ice Cream leads to Community Innovation, How Sweet! 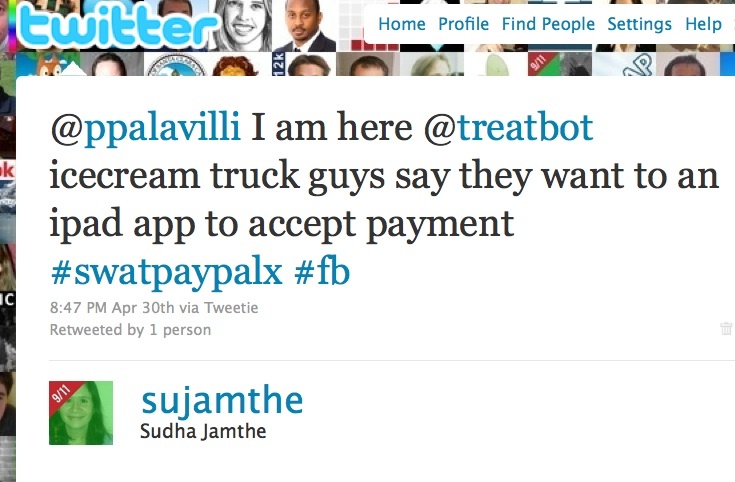 Friday night I joined StartupWeekend mixer at PayPal to pickup a cone of icecream from @treatbot (yes a tweeting ice cream truck). I had been privileged to work with the StartupWeekend team to host them at PayPal campus and was ready for icecream, and ready for 150 geeks to come together brainstorm ideas, form teams and build and launch cool apps within the weekend. Naturally, I asked Ryan who was at the icecream truck why he was asking for cash and not taking PayPal. He said he was waiting for the Ipad with 3G and wanted a point of sale app to accept Payment and would love it to be PayPal. What I did next led to a cascade of activities and here I am! What did I do, I did what comes to me naturally! PayPal has a team of people who had volunteered to support the event on campus and got excited by the energy and decided to build their own app and were brainstorming ideas. They saw the tweet and decided to build it. If a customer wanted it that is what they would build! Here I am sitting at the final day demos. The PayPad was born here and here's the demo. The team came together, learned Ipad programming, and built and thought through how to get a storefront for a customer on the Ipad. Here's to you @treatbot!!! Are you ready to beta this? I have been lucky to be working with the organizers of the IPadDevCamp as they planned to bring 400 awesome developers to PayPal campus for a community driven innovation this weekend. We got started 6 weeks back and I spent time building out the PayPal team supporting this event optimized to get our campus to support 1000 concurrent wifi connections, to make 400 geeks feel comfortable for hacking and our Mobile team and evangelists plan a session about PayPal Mobile embedded Payments. On friday Apr 16th, 400 developers arrived, brainstormed ideas, formed teams and began developing apps. All Saturday they coded and built app. The team energy and raw brainpower was amazing. We could see the hope of new ideas forming. Its been fun, *lot* of hard work, very humbling to learn and to be surrounded by such smart minds and inspiring to see such amazing creativity all around me. We had good keynotes. Among the logistics running around, I got to hear only Larry Tesler. He said something that seems to resonate well as I see the demos live now. The Ipad is not a big Iphone and the developer aware of the difference can build different applications for each and become a winner of this space. I am sitting now watching the demos live. They have been 54 new apps that are launching now. Awesome apps ranging from social games with multiple users using 3-4 Ipads simultaneously, eg. Ipad Slot Machine, Whack a mouse, unique use of Ipad for variety of disabilities, and lots of opensource code on github. So much legacy as people built upon their work from past IphoneDevCamps. Nice! Congratulation everyone! I work for this feeling of hope with community driving innovation, bonding and building out a full conference and solve real problems and sharing to create giant shoulders for others to build more solutions! I am here Day2 of Chirp, Twitter Conference, hackday. Chirp is organized by Carsonified who organizes FOWA and is the king of the event experience - All geek, open, free setup to hack and network! Evangelists from PayPal, Linkedin, British Telecom Kevinmarks are all hobnobbing here. There are about 500 geeks here, about 250 have been hacking head down. 117 demos were launched within this hackday, 7 are demoing on stage to Merissa Mayer, @blippy @pg Paul Graham critiquing them. 3. Twitpic Noaheverett, @twitsnaps, @Rodney Rumford of Tweetphotos are all here from twitter photo companies and here launched crowdreel a new app hacked and has 19Mil photos within 2 weeks. 4. Tap11 - Google Analytics for Realtime web. 5. Sonicliving - started all at 2am last night and build app integrating music from everywhere shared by your social graph. ps: I have videos and pictures which I'll upload and update here later , folks. They did sessions on OAuth, @Anywhere, Scala, Streaming API, but most important is they listened chatted and engaged with developers all day long. That just summarizes it. Does your social media strategy suffer from Slide 29? BL Ochman's blog post resonates well with me so I want to share my 2 cents about the role of social media in a company. Ochman's point is that some agencies add social media as an afterthought and do not understand that it is not about Twitter and Facebook buzz but a state of mind to be transparent and listen to customers. I work on social media for PayPalX Platform, building out community innovation by using social media. My team offers social campaigns for launches, social media at events as a way to engage and listen to developer ecosystem and offers support via Twitter. My main job is bringing about the innovation with transparency but it is not surprising to hear needs for tactical event templates for social media. Recently I have been looking into what is the best way for us to provide localization of social media for the same brand for global geos. We have our common brand 'paypalx' we have several geos who are social savvy with people who have created their own handles. Now we need to arrive at optimal guidelines for rest of the regions. I have created training plans to educate people who are experts in our product and real customer advocates to become social media savvy. We have a bunch of agencies local to each geo offering to do social media for local events. We experimented with one in Singapore recently. As we scale this globally across 190 countries, the challenge is not creating another slide or template and finding the right time zone for training timings or visits, but education on the role of social media in enhancing our goals by being transparent, embracing customer feedback and building solid process and programs to build on the strength of real passionate people in the company. Are you facing similar situation in educating your company about the real power of social media, are you making decisions about localization of social media for global markets, do you have a story on what worked or did not work? I'd love to hear from you. You can add comments or trackbacks or ping me on Twitter @sujamthe. If I get enough nuggets of wisdom, I'll do a followup post. Stay Tuned! Listening to Aaron Patzer, CEO of MINT shares his lessons of growing Mint from idea to $170M acquisition. I had a different view of Mint as a company which was getting lot of press and growth but didn't know to hire really passionate early employees dying to be part of Mint. I knew of a friend who was super passionate about personal finance and was referred by a Mint angel investor and did not make it through to even get an interview call giving a sneak peek into some some growth pains as they scaled. I am sitting at FOWA Miami and listening to Aaron Patzer, I hear a very different he shares the real story of his experience. Mint developed estimates for lead-Gen for categories Credit Score, Credit cards, IRS, CDS, Mortgage redifinancing. Aaron built a justification of each of these as estimates to CPA of $30/user. So the built a B Model on lead gen and estimated user base x rev.user/yr = Mint opportunity at $1Bil. 'Why" is more important than "what" in hiring interview. He shared his interview style. My notes: I wish we had heard more from Aaron's practical experience of scaling team from Engg to business folks, as this is where they seemed to have hired initial set of people based on where they came from and not so much on their real passion for Mint. Is there any lesson on hiring, team building as you scale and lessons in building a real management team as Mint seemed to have done it successfully to exit. This is typically a leap for an engg founder to comprehend what it takes to be successful here. Aaron gave a Book Referral : Top Grading by Bradford D.Smart. I want to check it out for some learning! Offered free alcohol and won people's choice award and leveraged it to next level of PR. Talk to as many people as possible, don't be secretive, let them poke holes. Did concepts chart of value and tested with normal people at train stations. Q: Missed the user question, but Aaron's answer had a nugget of wisdom here. Mint hired someone who did UI wireframe to Product dev instead of a silod resource so it helped in smart execution of Mint UI. Summary: One of the most honest and valuable startup entrepreneur lessons I've heard it a while. Many of you know me as the Facebook enthusiast running the Bay Area Facebook Meetup and volunteering at grassroots Hackathons and Community Leadership Summit. 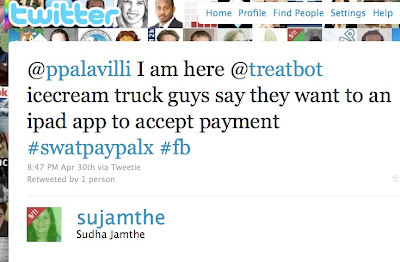 Then there is my real job, as Social Media Strategist at PayPal, where I am part of the PayPal Developer Network. Some of you know of my pet project "socialmints" where I was part of a visionary team who built the first micropayments app for Facebook in early 2008, allowing PayPal integration to developers like Blake Commagere, Puzzlebee, Zoo and many Game Apps to offer virtual currency to play with virtual goods. Today my two worlds are merging into each other as Facebook has teamed up with PayPal to offer PayPal as an option to buy Facebook Credits and Facebook Ads. It has sparked a lot of excitement from lot of media, inc my favorite Allfacebook.com who was the first to write about Facebook and Payments since GSP08, GigaOM, TechCrunch, VentureBeat, CNET, WSJ, Associated Press, Business Insider, Reuters, Mashable, AllThingsD, ReadWriteWeb, FinancialTimes, RegisterUK. It is an exciting new era for developers who are waiting! It opens two worlds - the largest social network where we hang around with our friends, send free gifts and valentines and a secure Payment platform that is compliant with global laws and takes care of risk models to avoid, so we can build apps and focus on truly monetizing them. As users, we can just continue sending sheep to our friends and BuddyPoke hugs with total peace of mind knowing that PayPal is taking care of the risk and compliance and security in the background. ps: Thanks to Tsukuyomi-No-Mikoto on Flickr for the BuddyPoke picture.